or "Continuous Positive Airway Pressurisation"was developed almost 20 years ago by Professor Colin Sullivan in Sydney, Australia. 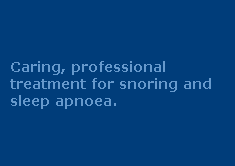 Hundreds of thousands of people around the world have now been successfully treated via CPAP therapy. CPAP therapy is nearly 100 percent effective and so it is generally considered to be the 'Gold Standard' for the treatment of sleep disordered breathing, especially severe obstructive sleep apnoea. CPAP therapy delivers gently pressurised air into the airway through a specially designed mask which is attached to a discreet and extremely quiet pressure pump. The CPAP pump does not 'breathe' for the wearer; it simply creates an 'air splint' by gently inflating the airway and holding it open so that the patient can breathe without obstruction while asleep. Recent advances in pump technology make modern CPAP machines almost undetectably quiet. A wide variety of different CPAP masks, headsets and accessories are available to ensure a completely comfortable night's sleep. Our CPAP therapy nurses will take the time to help you become fully accustomed to your CPAP treatment and will keep working with you until you (and your partner) enjoy better sleep than ever before. Discuss your requirements with a friendly sleep therapist on 1300 246 637.